Researchers at UC San Diego say they've used a combination of 3D Printing and stem cell therapy to heal severe spinal cord injuries. 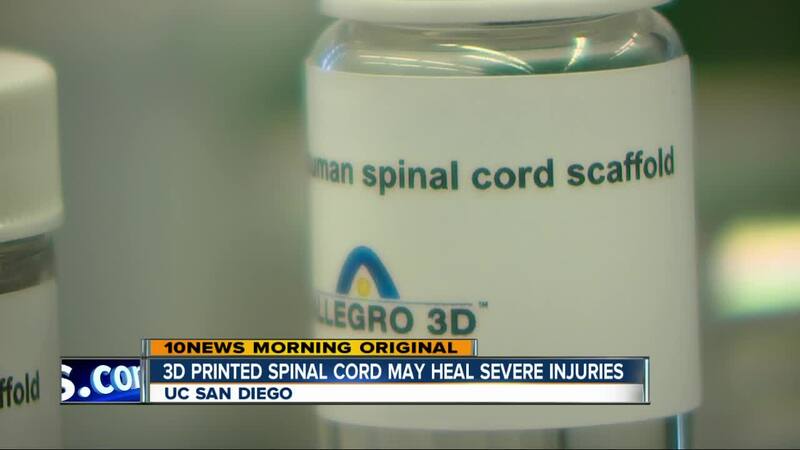 LA JOLLA, Calif. (KGTV) - Researchers at UC San Diego published a study this week, showing that a mix of 3D printing and stem cell therapy can be used to treat severe spinal cord injuries. Scientists from the schools of engineering, biomedicine and neuroscience collaborated on the project, which they say is a huge breakthrough for people with paralysis. The researchers had to build a 3D printer from scratch, which could make a model of a spinal cord section based on MRI imaging. They then load it with stem cells and implant it into the test subject. In tests on rodents, the 3D spinal cord and stem cells spurred new neuron growth and helped restore function. "When there's an injury, the local population of cells, the neurons, die," explains Dr. Kobi Koffler with the school of Neuroscience. "With these stem cells, we're bringing them back." The team had to build a 3D printer from scratch that could manufacture the spinal cord pieces. "Every patient's damaged organ or tissue is different. You cannot use traditional manufacturing methods to do this," says Dr. Shaochen Chen with the School of Engineering. "3D Bioprinting is perfect to do that." The 3D models are made from a mix of water and biopolymer backbones. That material degrades within the body over a year but gets replaced by the body rebuilding organic tissue. Dr. Koffler says people with the most severe kinds of spinal cord injuries are the most likely to benefit from this type of research. "These patients have the least to lose if we go in and transect everything and put our implant in," he says. "They have the least to lose in terms of function." The team hopes to scale up the project to begin testing on larger animals. They hope it will eventually be available for humans. "If we can help them, that's a huge impact," says Dr. Chen. "We love those high impact projects." A full release with details of the research is available on the school's website here .